It's Denmark's time to shine. Investors have been piling into European stocks over the past few years as they hunt for bargains in markets that were beaten down during the euro crisis. But with stocks in Spain, Italy and Ireland now relatively expensive, investors are turning their attention to Denmark. 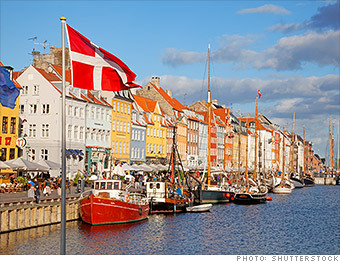 "Denmark was neglected as some of the cheaper markets got bid up in a hurry," said Christopher. In addition, the Danish economy is showing signs of strength, and the nation's budget deficit is shrinking, according to a recent report from economists at Danske Bank. "We have been waiting for a long time but, at long last, the recovery seems to be taking hold," the report states.